The End of Time is a two-part story made up of the fourth and fifth of five special episodes of the British science fiction television series Doctor Who broadcast between December 2009 and January 2010. The End of Time was originally broadcast in the United Kingdom on BBC One on 25 December 2009 and 1 January 2010, and is the fifth Doctor Who Christmas special. This is the last story for lead actor David Tennant, who handed over the role of alien time traveller the Doctor to Matt Smith. It is also the last Doctor Who story written and produced by Russell T Davies, who shepherded the series' return to British television in 2005 and served as the series' executive producer and chief writer. Davies was succeeded as executive producer and showrunner by Steven Moffat. Bernard Cribbins, who appeared in the story "Voyage of the Damned" and throughout Series 4 as Wilfred Mott, grandfather of Donna Noble, acts as the companion to the Doctor in this two-part story. The special also features the return of many other actors to the show, including Catherine Tate, John Simm, Jacqueline King, Alexandra Moen, Billie Piper, Camille Coduri, Freema Agyeman, Noel Clarke, John Barrowman, Elisabeth Sladen, Tommy Knight, Jessica Hynes and Russell Tovey. The story features the Tenth Doctor (Tennant), who has been running from a prophecy of his impending demise, as he is drawn into a scheme by his old nemesis, the Master (Simm). The Master brings the human race under his control as part of an elaborate plan to restore the world of his and the Doctor's own people, the Time Lords, from their demise in the Time War referred to in the series. The Doctor is able to avert this, but incurs fatal injuries. In the episode's conclusion, as has happened before, the Doctor regenerates and becomes a new man with a new personality and physical traits, setting up the show's following series with Matt Smith as the star and Steven Moffat as executive producer. The episode opens with a view of Earth from space and a man narrating that in the last days of humanity, everyone had bad dreams. We then see Wilfred Mott (Cribbins), entering a church and seeing a blue box painted on a stained glass window. Meanwhile, on the Ood-Sphere in 4226, the Ood warn the Doctor (Tennant) that the Master has returned, heralding "the end of time". Back on Earth, a cult of women resurrect the Master (Simm) in Broadfell Prison, but his ex-wife, Lucy Saxon (Moen), sabotages the ceremony, causing the Master to be brought back with incredible strength but constant hunger. Arriving back on Earth on Christmas Eve, the Doctor encounters Wilfred, who helps track down the Master. The Doctor explains that he fears a prophecy about "he will knock four times" that will predicate his death. The Doctor finds the Master at wastelands outside London. The Doctor learns that the Master has been suffering from hearing the sound of drums, which is not associated with his insanity but implanted externally. Before the Doctor can learn more, the Master is taken by armed troops and placed in custody of billionaire Joshua Naismith (David Harewood). Naismith has recovered a broken alien "Immortality Gate" and wants the Master to fix its programming. The Doctor regroups with Wilfred, who is able to identify Naismith. Wilfred prepares to go with the Doctor, but an apparitional woman in white (Bloom) warns him to arm himself to protect the Doctor before departing. At Naismith's mansion, the Doctor and Wilfred meet two Vinvocci disguised as humans, who assert the Gate is a harmless medical device from their homeworld. The Doctor is too late stopping the Master from activating the Gate, which he has reprogrammed to replace all of humankind's DNA with his own, making humanity his own "Master race"; only Wilfred, protected in the Gate's control rooms, and Donna, due to Time Lord biological traits she gained earlier, are unchanged. Donna sees many of the monsters she encountered with the Doctor, Racnoss, Daleks, Davros, the Ood, and the Vespiform as she hears The Master's laugh. The Master and his doppelgangers taunt the Doctor, who can only look on in horror. Elsewhere, the Lord President of the Time Lords (Dalton) observes the situation and asserts their plan can continue, and that the Time Lords have returned. The Doctor and Wilfred become fugitives from the Masters, and take refuge on the Vinvocci spacecraft to strategise. Meanwhile, the Lord President, following a prophecy about the future of the Time Lords after the Time War, implants the sound of drums in the Master's head as a child; in the present, the billions of Masters amplify that signal. Still needing a focal point, the Lord President orders a whitepoint star to be launched to Earth. The Master collects it and uses it to create a strong link that allows the Time Lords to bring Gallifrey out of the time lock they were stuck in and in close orbit to Earth. The Lord President and a small ensemble of Time Lords appear in Naismith's mansion. Meanwhile Donna, on the phone to Wilfred, visions the Vespiform hovering in front of her as the Master's clones approach her. Suddenly, a bright light comes out of her chest, after which, she and some of the clones collapse. The Doctor fears the horrors that Gallifrey will bring to Earth, and as the Vinvocci bring their ship to land, the Doctor jumps from it into Naismith's mansion, armed with only Wilfred's gun. The Doctor finds himself torn between shooting the Master or the Lord President to sever the link and return Gallifrey to the time lock. Among the Lord President's ensemble, the Doctor spots the same woman in white Wilfred had seen, who silently communicates to him with her eyes. The Doctor understands, and fires the gun at the whitepoint star instead, shattering it. As Gallifrey is pulled back, the Lord President, revealed to be Rassilon, attempts to kill the Doctor, but the Master intervenes, saving the Doctor and seeing his act as revenge for what the Time Lords had done to him. Soon after, the Master, the Time Lords, and Gallifrey have disappeared, and humanity has been restored. The Doctor considers himself victorious until he hears four knocks. He finds Wilfred had come to help him, but is now trapped in one of the Gate's isolated control rooms that is about to be flooded by radiation. The Doctor sacrifices himself by stepping into the other control room, freeing Wilfred before the room is flooded. Though his body was able to absorb the radiation, the Doctor knows his body will soon regenerate. After dropping Wilfred back home, the Doctor visits past companions and acquaintances; Martha Jones (Freema Agyeman) and Mickey Smith (Noel Clarke) who have married and are working as freelance alien hunters, Sarah Jane Smith (Elisabeth Sladen) and her son Luke Smith (Tommy Knight), and Captain Jack Harkness (John Barrowman). He also visits Verity Newman (Jessica Hynes), the great-granddaughter of Joan Redfern who the Doctor had previously met in "Human Nature". He then travels forward in time to Donna's wedding where he gives Wilfred and Sylvia Noble (Donna's mother) a lottery ticket that he had bought for Donna with money borrowed from her deceased father. Finally, the Doctor visits Rose Tyler (Billie Piper), on New Year's Day 2005, three months before she meets him as the Ninth Doctor and tells her she will have "a really great year". As the Doctor succumbs to the radiation on his trip back to the TARDIS, Ood Sigma appears before him while the Ood sing "Vale Decem" (Goodbye Ten). Sigma concludes the prophecy by saying 'This song is ending, but the story never ends'. Inside, the Doctor sets the TARDIS in flight before declaring "I don't want to go" and then regenerates, causing an explosion that destroys the control room. The Eleventh Doctor (Matt Smith) inspects his new body before realising he is crashing. He screams "Geronimo!" as the TARDIS hurtles back to Earth. At the start of "Part One" the Doctor explains his delay to Ood Sigma. Among his various adventures, he mentions having married "Good Queen Bess" and refers to her nickname, 'The Virgin Queen'. At the end of "The Shakespeare Code" Queen Elizabeth appears infuriated at seeing The Doctor, calling him her sworn enemy; he does not recall meeting her and presumes he will meet her in his future, which eventually happens in "The Day of the Doctor". One of the two dissident Time Lords, described as "The Woman" in the credits, visits Wilfred on several occasions, appearing and disappearing in unexplained ways. When she lowers her arms to stare at the Tenth Doctor he appears to recognise her, but when later asked by Wilfred about her identity, the Doctor evades the question. British newspapers The Daily Telegraph and The Daily Mail identified the character as the Doctor's mother as early as April 2009. Russell T. Davies wrote in an email to the author of The Writers Tale, "I like leaving it open, because then you can imagine what you want. I think the fans will say it's Romana. Or even the Rani. Some might say that it's Susan's mother, I suppose. But of course it's meant to be the Doctor's mother." The Doctor at one point addresses the Lord President as "Rassilon", the name of the founder of Time Lord society from the classic series, although the character is only identified in the credits as "The Narrator" in part one and "Lord President" in part two. In the accompanying episode of Doctor Who Confidential, Russell T Davies stated that the character's name was indeed Rassilon. Verity Newman is played by Jessica Hynes, the same actress who played Joan Redfern, who is Verity's great-grandmother, in the episodes "Human Nature" and "The Family of Blood". The name "Verity Newman" is based on Doctor Who creator Sydney Newman and the show's first producer, Verity Lambert. Professor John Smith averred that his parents were Verity and Sydney. A pocket watch featured prominently in the plot of both Hynes's original episodes, and a pocket watch is featured on the cover of Newman's book. When the Doctor visits Captain Jack Harkness in the alien bar, the song playing in the background ("My Angel Put the Devil in Me") was sung by Tallulah in the episode Daleks in Manhattan. After regenerating, the Eleventh Doctor is disappointed that he is "still not ginger", referring to the Tenth Doctor's comment "Aw, I wanted to be ginger... I've never been ginger!" in "The Christmas Invasion". This line was a source of complaint for some viewers, leading the BBC to issue a statement clarifying its intent. I knew I'd write David's last episode one day, so I've had this tucked away. You do think: 'How can the stakes get bigger?' And they do. They really do. I don't mean just in terms of spectacle, but in terms of how personal it gets for him. I've had these last pages ready in my head for months and months... It takes as long to write as it does to type. [...] So I keep rattling away until... The last words. Trouble is, last words don't really exist. In ten minutes' time, I'll change my mind about Scene 25, and go back to write something different. Then I'll get up tomorrow and change all sorts of stuff, before sending it to the office. And then the proper rewrites start. [...] Even then, you keep writing; you keep writing; you think of lines people should have said for the rest of your life. Still, what the hell, let's allow a bit of ceremony. The last words. Maybe I should sit here for hours, deliberating over them. But I know exactly what they are. I type them out. Times like this, typewriters would be better. Typewriters are romantic. A little metal letter should fly. It should hit the paper, whack! Tiny particles of ink should puff and settle. But no, there's just a plastic keyboard. I press the key. The final letter is n. Then a full stop. And that's it. Save. Done. Good. —  Russell T Davies, Doctor Who Magazine issue 407, Production Notes. When asked about the emotional impact of writing his last Doctor Who script, he said, "I would have thought that when I handed in the last script I might have burst into tears or got drunk or partied with 20 naked men, but when these great moments happen you find that real life just carries on. The emotion goes into the scripts." Tennant and Julie Gardner separately said that they cried when they read the script. David Tennant – Really, from this moment on, the Doctor's card is marked. Because when we come back in "The Waters of Mars", it's all become a little bit darker. Julie Gardner – And as we know, David, he really does knock four times. Tennant – Yeah, absolutely, and if you think you've figured out what that means, you're wrong! Gardner – But when you do figure it out, it's a sad day. —  David Tennant and Julie Gardner, Doctor Who: The Commentaries, "Planet of the Dead"
Writing in his regular column in Doctor Who Magazine issue 416, Davies revealed that the original title for "Part One" of The End of Time was "The Final Days of Planet Earth", while "Part Two" was always referred to as "The End of Time". Due to the sheer scale of the story, however, it was decided that both instalments needed the same title, differentiated by part numbers, the first such instance since Survival. Davies's script for the second episode finished with the Tenth Doctor's final line, "I don't want to go", followed by action text describing the regeneration and ending with the words, "And there he is. Blinking. Dazed. The New Man." He then sent the script to his successor Steven Moffat, who is responsible for all of the Eleventh Doctor's dialogue that follows. Moffat, as incoming executive producer, also assisted in the production of the final scene. The first location recording for this story took place on Saturday, 21 March 2009 at a bookstore in Cardiff. Jessica Hynes was recorded signing a book titled A Journal of Impossible Things, by Verity Newman. Recording also took place at Tredegar House in Newport,[location 1] which had previously been used for the recording of the 2008 Christmas special "The Next Doctor". John Simm, who played the Master in the 2007 series finale episodes "Utopia", "The Sound of Drums" and "Last of the Time Lords", was spotted on location during the Tredegar House recording. Recording that took place during the Easter Bank Holiday was widely covered by the British press: Catherine Tate recorded several scenes in the episode in Swansea, including one recorded in the Kardomah Café[location 2] and another depicting her character getting a parking ticket. Other recording locations included Nant Fawr Road in Cyncoed, Cardiff[location 3]—the previously regular location used for the Noble household—where recording on 12 April showed Cribbins wearing reindeer antlers and boarding a minibus. Recording took place in the following week on Victoria Road, Penarth,[location 4] in an area which had been regularly used for a location for Sarah Jane Smith's neighbourhood in The Sarah Jane Adventures. Elisabeth Sladen, who played Sarah Jane Smith, and Tommy Knight, who played her son Luke, were recorded on location with David Tennant. On the night of 20–21 April, Cribbins recorded a Christmas scene on Wharton Street[location 5] in Cardiff's city centre, with a large Christmas tree and brass band. 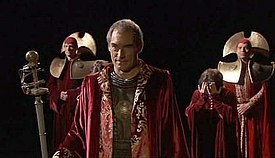 The science fiction website io9 published a photograph showing Tennant alongside Simm and Timothy Dalton, with Dalton dressed in Time Lord robes. Rumours of Dalton's involvement in the specials had previously appeared in British tabloids. On 26 July 2009, io9 published an interview with David Tennant in which he confirmed Dalton's involvement in the specials. Due to the special effects used to simulate the violent nature of the Tenth Doctor's regeneration, the glass central pillar in the middle of the TARDIS console was damaged so badly it had to be rebuilt prior to the recording of the next series. It was made by Bristol Blue Glass based in Brislington. A teaser trailer, featuring Timothy Dalton's opening narration and brief shots of the main characters, was shown at Comic-Con 2009. A 'Next Time' trailer, consisting some of the Ood Elder's monologue with excerpts from various scenes in part one, was included at the end of "The Waters of Mars". In November 2009 a special preview of the opening moments on the Ood Sphere was shown on the Children in Need telethon. The pre-Christmas publicity trailer and promotional clips also showed a selection of scene excerpts from part one. Following the broadcast of part one, a trailer for part two was released on the BBC Doctor Who website. The BBC also released the first two minutes (after the opening titles) of part two. Additionally, the 2009 Christmas idents for BBC One featured David Tennant as the Doctor using the TARDIS as a sleigh pulled by reindeer. Though unrelated to the episode, it was used to introduce both parts of the story, with Tennant himself providing a voiceover introduction for Part Two. After Part Two was broadcast, the ident continued for the remainder of the day but no longer featured Tennant, since he was no longer the Doctor. Concurrently with the recording of the story, a music video was produced, featuring the cast, extras, crew and CGI Adipose, all lip-synching and dancing to the Proclaimers' 1988 song, "I'm Gonna Be (500 Miles)". Tennant appeared with each pair of featured actors, as well as with the Proclaimers themselves. Overnight ratings placed Part One as the third most watched programme of Christmas Day, behind EastEnders and The Royle Family with a provisional viewing figure of 10.0 million viewers. The episode achieved a 42.2% share of the total viewing audience, and an appreciation index score of 87, considered 'Excellent'. Final consolidated ratings placed Part One as the third most watched program of Christmas Day, behind The Royle Family and EastEnders with a final figure of 11.57 million viewers. This is the highest timeshift that the show has received since its revival (the previous highest being 11.4 million for The Next Doctor in Christmas 2008). When simulcast HD figures are added to the BBC One transmission, Doctor Who actually comes out as the most watched show on Christmas Day with a total of 12.04 million viewers, narrowly ahead of The Royle Family and EastEnders. Overnight ratings placed Part Two as the second most watched programme of New Year's Day, behind EastEnders, with a provisional viewing figure of 10.4 million viewers (including 389,000 watching on BBC HD). The episode achieved a 35.5% share of the total viewing audience on an evening where an estimated 30 million viewers were watching TV in the UK. Official BARB ratings placed Part Two as the second most watched programme of the week behind EastEnders at 11.79 million viewers; however, when the simulcast figures on BBC HD are added, an additional 480,000 viewers bring the total figure to 12.27 million. When this figure is recognised, the program becomes the most watched of the week. This makes The End of Time only the third instance in which the show has achieved such an honour in its extensive history. Additionally, The End of Time received over 1.3 million requests on BBC's online iPlayer. In a review of the first part of the story, Peter Robins of The Guardian states that Doctor Who was never going to stop for Christmas this year as "there are stories that need completing, fireworks to set up; the End of Time means No End of Plot." Robins notes that the first part had been "a rush" and questions whether any previous Who story managed to erase the entire human race before the end of the first episode or done it in such a comic and Christmas friendly way? But Robins concedes that when the story is done it is the quieter more emotional parts from the beginning of the episode that the viewer will remember. Robins also notes that Cribbins seems to be playing the same role that Tate did by "becoming the tragic hero while remaining the comic relief." Robins concludes by saying that the story did not need to be a Christmas story in the way previous ones have been. Andrew Pettie of The Daily Telegraph states that his Doctor Who revelation came in the nick of time after previously thinking that the show was overrated. Pettie states that Davies raised the stakes as high as the laws of physics would allow. Commenting on Cribbins' performance, Pettie states that he cut a King Lear like figure and notes that the Master's plan was evil even by his standards. Pettie notes as the credits rolled his thoughts turned to the dramatic shortcomings of the show before realising that the "true brilliance of Doctor Who can only be felt if you're experiencing it in the company of wide-eyed seven year-olds" a comment which he likens to Christmas itself. Mark Lawson of The Guardian stated that the plot device of the Master repopulating the human race as himself "gave Simm the chance to wear a lot of different costumes and the special effects department to show some of the digital ingenuity which has helped the show's renaissance." However, Lawson goes on to say that the plot was slightly unfortunate given that some newspapers complained of Tennant overload over the festive period (Tennant managed to make 75 appearances on the BBC over the festive period). Lawson also went on to praise Tennant for bringing a "proper tragic force" to the role and was again shown in this last story. But on a side note Lawson states that the script seemed to be modelled on Hamlet, a role which Tennant took on both on stage and on TV during 2009. Concluding after a tender meeting with Rose, Lawson states that "the final line Davies gave to Tennant was a suddenly regretful "I don't want to go! ", and it is likely that, somewhere inside, both actor and writer feel a little like that." In his review of Part Two published the day after transmission, Andrew Pettie of The Daily Telegraph awarded a rating of four stars out of five, summing up the episode as "a barnstorming hour of family entertainment." Despite expressing slight dissatisfaction with the plot, which he perceived as excessively complicated, Pettie admitted that the episode "charged forward with such apocalyptic brio it was hard to be unduly worried about what, precisely, was going on." Praising Tennant's final performance as the Doctor, he also commented on the "unnerving experience" of seeing the character so helpless in his final appearance, but ended his review on a note of optimism for the future of the series with a new lead actor: "[Matt] Smith's youth and lack of fame make his Doctor Who an exciting prospect." The episodes were first shown in the United States on 26 December 2009 and 2 January 2010, on BBC America. The broadcast of part two on 2 January helped BBC America to earn its highest ever primetime rating. The two episodes also reached the top two positions on the US iTunes Store, where they were available to purchase for download by American users. Both episodes were first shown in Canada back-to-back on 2 January 2010, on Space. Prime Television New Zealand broadcast Part 1 on 7 February 2010 and Part 2 on 14 February 2010. The Australian Broadcasting Corporation broadcast Part 1 on 14 February 2010 and Part 2 on 21 February 2010. Both parts of The End of Time were released on DVD in the UK in January 2010 as a double pack with "The Waters of Mars". The specials were also released on the same day on DVD and Blu-ray in a collection entitled Doctor Who – The Complete Specials. The set includes "The Next Doctor", "Planet of the Dead", "The Waters of Mars" and The End of Time. In North America, The End of Time was released in February 2010 on DVD and Blu-ray, as a single release, and as part of a package of the final four David Tennant specials. The End of Time is also part of the special 50th Anniversary Regenerations DVD box set and book collection released on Monday 24 June 2013 and limited to 10,000 copies. This story was also released as part of the Doctor Who DVD Files in issue 56 on 23 February 2011. To celebrate 5 years to the date after its original broadcast, Watch aired both parts of the story on 1 January 2015. The ten Christmas specials between "The Christmas Invasion" and "Last Christmas" inclusive were released in a boxset titled Doctor Who – The 10 Christmas Specials on 19 October 2015. Selected pieces of score from this two-part special, as composed by Murray Gold, were included in the specials soundtrack on 4 October 2010, released by Silva Screen Records. ^ Towards the end of episode two it is revealed that this character is Rassilon. ^ a b c "Last script for the doctor". Scotland on Sunday. 5 April 2009. Retrieved 16 April 2009. ^ Davies, Russell T (7 April 2009). "Dr Who's Easter special". BBC Breakfast (Interview). Interviewed by Bill Turnbull;Kate Silverton. London: BBC One. Retrieved 7 April 2009. ^ "BBC – Doctor Who – The End of Time – Episode Guide". BBC. 27 December 2009. Archived from the original on 29 December 2009. Retrieved 3 January 2010. ^ "TV REVIEW Doctor Who "The End Of Time" Part One". SFX Magazine. 25 December 2009. Retrieved 3 January 2010. ^ Peter Robins (25 December 2009). "Doctor Who: The End of Time – the verdict". The Guardian. London. Retrieved 3 January 2010. ^ Telegraph reports on Claire Bloom's casting as "the Doctor's mother"
^ The Daily Mail reports on Claire Bloom's casting as "the Doctor's mother"
^ a b c d Anders, Charlie Jane (23 March 2009). "Discover Both Ends of the "Spectrum Of Spock." Plus The Doctor's Worst Nightmare". io9. Retrieved 18 April 2009. ^ "Davies on Doctor's Easter 'romp'". BBC. 9 April 2009. Retrieved 16 April 2009. ^ Colville, Robert (11 April 2009). "Russell T Davies Doctor Who interview: full transcript". The Daily Telegraph. London. Retrieved 16 April 2009. ^ "David Tennant to leave Doctor Who". Doctor Who microsite. BBC. 28 October 2008. Archived from the original on 21 December 2008. Retrieved 17 April 2009. ^ Davies, Russell T (1 April 2009). "Production Notes". Doctor Who Magazine. No. 407. Royal Tunbridge Wells, Kent: Panini Comics. p. 4. ^ a b c Julie Gardner, James Strong, David Tennant (11 April 2009). "Journey's End". Doctor Who: The Commentaries. Season 1. Episode 15. BBC. BBC 7. ^ Russell T Davies, Gareth Roberts (writers), James Strong (director), Tracie Simpson (producer) (11 April 2009). "Planet of the Dead". Doctor Who. Event occurs at 55:10. BBC. BBC One. ^ "Desert Storm". Doctor Who Confidential. Series 2009. Episode 1. 11 April 2009. BBC. BBC Three. ^ a b Davies, Russell T. "Production Notes". Doctor Who Magazine. No. 416. Royal Tunbridge Wells, Kent: Panini Comics. p. 4. ^ Davies, Russell T (1 January 2010). "The End of Time part two – episode commentary". BBC. Archived from the original on 24 September 2015. Retrieved 2 January 2010. ^ "Allons-y!". Doctor Who Confidential. 1 January 2010. BBC. BBC Three. ^ Anders, Charlie Jane (25 March 2009). "Your Spock/McCoy Snark Forecast". io9. Retrieved 18 April 2009. ^ McEwan, Cameron K (30 March 2009). "Doctor Who: Bernard Cribbins Returns". Den of Geek. Dennis Publishing. Archived from the original on 20 June 2009. Retrieved 19 April 2009. ^ Anders, Charlie Jane (31 March 2009). "The Unexpected Doctor Who-Fringe Crossover! (Not Really.)". io9. Retrieved 16 April 2009. Anders, Charlie Jane (3 April 2009). "The Biggest Mystery About The Wolverine Leak – Solved!". io9. Retrieved 16 April 2009. ^ Lewinski, John Scott (4 April 2009). "Simm Returns as The Master in Doctor Who". Wired News. Retrieved 16 April 2009. ^ a b "Look at my face. Is my face bovvered by a ticket?". The Londoner's Diary. Evening Standard. 14 April 2009. Archived from the original on 17 April 2009. ^ "Walesarts, Kardomah Cafe, Swansea". BBC. Retrieved 30 May 2010. ^ "Cafe serves up a treat for Doctor Who fans". South Wales Evening Post. 14 April 2009. Retrieved 17 April 2009. ^ Staff reporter (13 April 2009). "Russell Davies' final show reunites old friends for a Doctor Who adventure". Western Mail. Retrieved 16 April 2009. Staff reporter (13 April 2009). "June Whitfield spotted with Doctor Who in Cardiff". South Wales Echo. Retrieved 16 April 2009. Smith, Lizzie (15 April 2009). "David Tennant and Catherine Tate reunite to film Doctor Who Christmas special". Daily Mail. London. Retrieved 16 April 2009. ^ Miloudi, Sarah (14 April 2009). "Catherine Tate spotted filming Doctor Who in Swansea sun". Western Mail. Retrieved 16 April 2009. ^ "Doctor flies in for day of filming in Swansea". South Wales Evening Post. 13 April 2009. Retrieved 16 April 2009. ^ a b Anders, Charlie Jane (13 April 2009). "Star Trek Comedy And Doctor Who Tragedy – Revealed!". io9. Retrieved 18 April 2009. ^ Tibballs, Phil (17 April 2009). "Doctor Who returns to Penarth". Penarth Times. ^ Pixley, Andrew (14 August 2008). "The Stolen Earth / Journey's End". Doctor Who Magazine. Vol. The Doctor Who Companion: Series 4 no. Special Edition 20. Royal Tunbridge Wells, Kent: Panini Comics. pp. 126–145. ^ McCarthy, James (22 April 2009). "Dr Who brings Christmas to Cardiff very early". South Wales Echo. Retrieved 23 April 2009. ^ Anders, Charlie Jane (15 June 2009). "Your First Look At Doctor Who's Next Big Guest Stars". io9. Archived from the original on 20 June 2009. Retrieved 16 June 2009. ^ Robertson, Colin (15 May 2009). "Licensed to exterminate". The Sun. London: News Group Newspapers. Retrieved 16 June 2009. ^ Jane, Charlie. "David Tennant Tells Us Why His Doctor's So Sorry, And What's To Come – doctor who". io9. Archived from the original on 28 July 2009. Retrieved 26 July 2009. ^ "Doctor Who's new TARDIS centrepiece made in Bristol". BBC. 7 April 2010. ^ "'Doctor Who' panel at Comic-Con". Archived from the original on 28 July 2009. Retrieved 26 July 2009. ^ Trailer – The End of Time, Part Two (Trailer). BBC. 25 December 2009. Archived from the original on 21 July 2012. Retrieved 27 December 2009. ^ Exclusive Scene – The End of Time, Part Two (Trailer). BBC. 25 December 2009. Archived from the original on 18 November 2015. Retrieved 27 December 2009. ^ "The End of Time – Ratings". The Doctor Who News Page. 26 December 2009. ^ "End of Time – Appreciation Index". The Doctor Who News Page. 29 December 2009. ^ "BARB Ratings". BARB. 8 January 2010. ^ "The End of Time Part One – Final Consolidated Ratings". The Doctor Who News Page. 8 January 2010. ^ "Doctor Who finale watched by 10.4m as Tennant bows out". BBC News. 2 January 2010. Retrieved 2 January 2010. ^ "Weekly Top 30 Programmes". Barb.co.uk. 18 March 2012. Retrieved 27 March 2012. ^ "Regeneration – Number One for Week". The Doctor Who News Page. 2 February 2010. ^ Robins, Peter (25 December 2009). "Doctor Who: The End of Time – the verdict". The Guardian. London. ^ "Doctor Who, BBC One, review". The Daily Telegraph. London. 29 December 2009. ^ Leach, Ben (30 December 2009). "David Tennant to make 75 appearances on BBC over Christmas and New Year". The Daily Telegraph. London. ^ Lawson, Mark (2 January 2010). "To be, or to regenerate – that was the question". The Guardian. London. ^ a b c d e Pettie, Andrew (2 January 2010). "In a blaze of special effects, this Time Lord's time was up". The Daily Telegraph. London: Telegraph Media Group. p. 5. ISSN 0307-1235. Retrieved 2 January 2010. ^ a b Seidman, Robert (6 January 2010). "BBC America Starts 2010 With Best Ever Night and Day". TV By The Numbers. Retrieved 8 January 2010. ^ Doctor Who – Winter Specials 2009 – Waters of Mars and The End of Time DVD: Amazon.co.uk: David Tennant, Billie Piper, Paul Kasey, Freema Agyeman, Ruari Mears, Catherine Tate,..
^ TV Choice. 20 December 2014-2 January 2015. pg. 151. ^ "Doctor Who News: Doctor Who - The Ten Christmas Specials". Doctor Who News. 1 October 2015. Retrieved 8 October 2015.